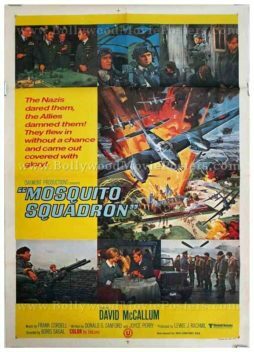 Vintage original movie poster of the World War II film, Mosquito Squadron (1969) for sale. This is an actual surviving vintage poster of the 1969 British action film starring David McCallum. Printed and circulated in India somewhere in the 1970s, this movie poster was originally designed for publicity of the film in India, but never ended up being used. This poster features a combination of two design techniques – hand painted / hand drawn as well as photographic still cut paste. The center of the poster features a brilliantly hand painted scene depicting a WWII bombing mission. Still photographs of key scenes from the film are pasted all around the poster. Its yellow back ground color gives this poster a very appealing look. Mosquito Squadron is a 1969 WWII film starring David McCallum. The film narrates the story of a squadron leader who dies during a bombing mission and his best friend, who survives and ends up falling in love with his wife.